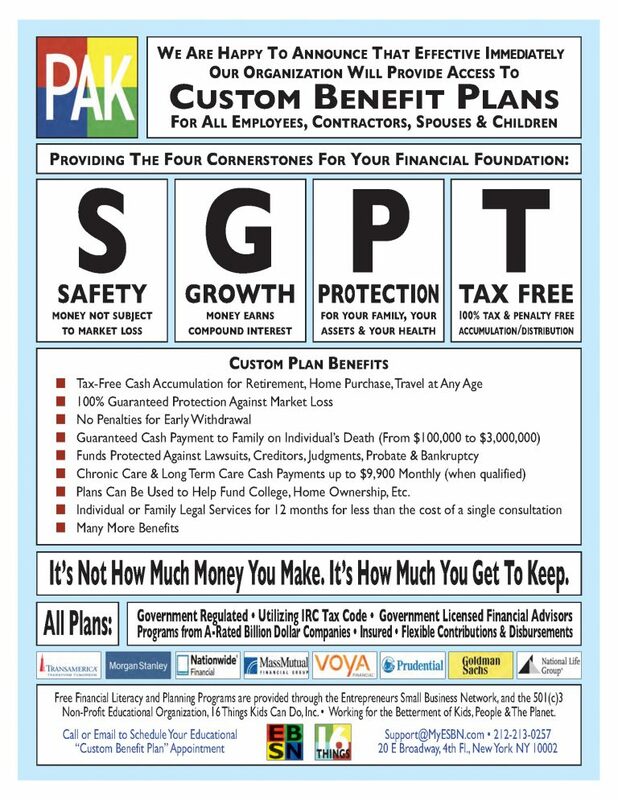 Custom Benefits Plans for all! It’s your money. We just make sure it stays your money. We don’t sell anything. We are free to go to the company that has the best program to meet that person’s goals. When we present plans, we don’t charge the people that we help. If they like the plan, they pay the company direct and then we have the company compensate us out of future profits. After all, who can afford it more? The people that need our assistance or companies with deep pockets? And for the organizations whose people we help? We charge them nothing for the work we do: Nothing to educate, zero to set-up, zero to administer. And everything we do is custom. Our Entrepreneurs Small Business Network provides accesss to multi-million, multi-billion dollar companies that have socially responsible services & programs. When we sit down to help people, everyone is not the same so we provide custom solutions. Success Is People Taking Action! 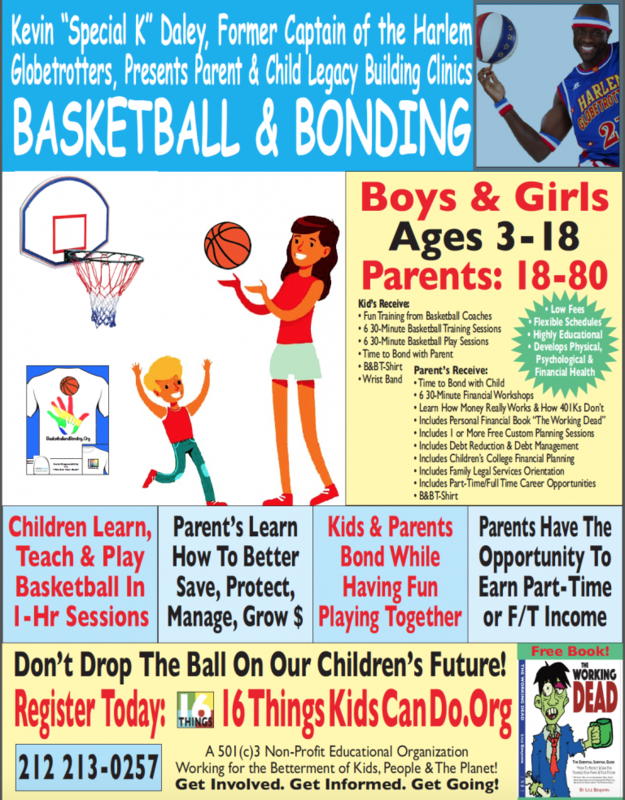 Basketball & Bonding is a great program that helps bring kids and their parents together in a unique, fun way. Basketball & Bonding bonds parents and their children through basketball. We do this in six one-hour sessions where the kids get trained in basketball while the parents go to financial workshops where they learn how to properly save, protect and grow their money for buying a house, funding their children’s education, and properly building for retirement. After 30 minutes, parents and kids back together and the kids spend 10 minutes teaching their parents what they learned (even if their parent played in the NBA!). For the last 20 minutes the kids and parents team up and 6-10 year olds play Horse and 11-16 years play games … but parents and kids play together on the same team to better bond. Community Partnership Centers bring our specialized programs to your neighborhood, get involved today. These are centers set up by ordinary people utilizing our programs to do outreach in their community. People can walk in and get free assistance in areas they need help including debt reduction/management, education, health, income, legal advice, ownership, protection, retirement, savings, taxes and work. 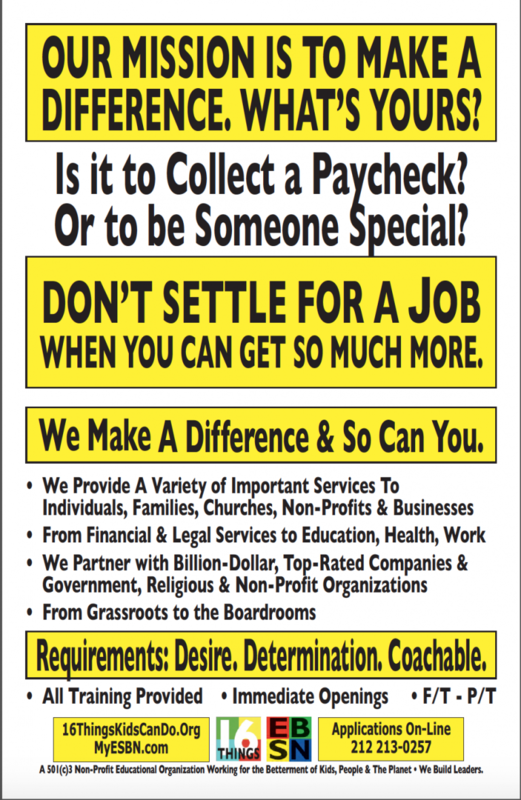 We work with five types of institutions (schools, churches & temples, nonprofits, government agencies, and businesses) provide programs & services designed to help five types of people (students, employees, business owners, retirees, and unemployed). And we make large companies pay the community center, not the people we are working to help. Starting in 2017, we are giving ordinary people (four per center) the opportunity to be of service to their community by opening up a Community Partnership Center in their neighborhood. This is a street level brick and mortar business where people come and get the help they need regarding debt, education, health, income, legal, protections, insurance, retirement, savings, taxes, and work/career. 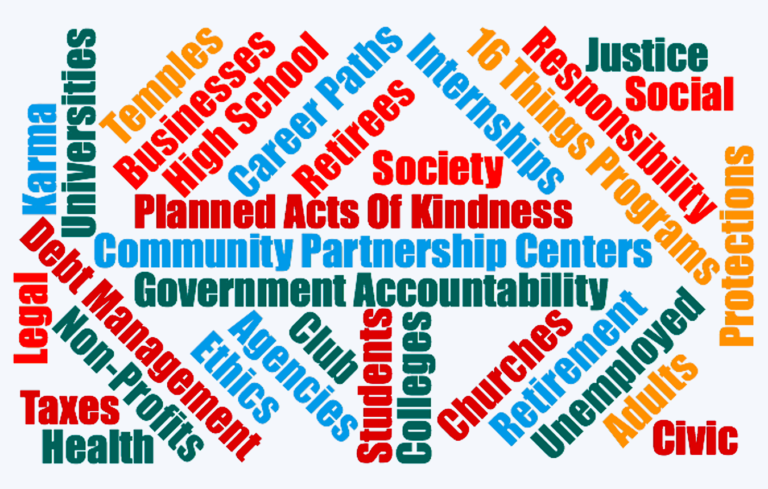 Through 16 Things Community Outreach programs, the CPCs work in conjunction with area schools, churches/temples, NPOs, Agencies and Businesses providing access to programs and services designed to actually help people. The CPCs do not charge the people they help, (read the previous column: “Custom Benefits Plans”), instead they make large companies pay for the work we provide. From set-up to start up, we provide all the training, licensing (when dealing with people’s money, we are licensed and government regulated) programs, materials and support services. The time frame is 2-3 months of team training and outreach before the CPC opens. Internship/Mentorship Programs to help you learn or teach skills in a positive atmosphere. Business/Entrepreneurship: Marketing, Business Management, Finance, Advertising, PR, Communications, Social Media for Books, Workshops, Programs, and Television. Publishing: Graphic Design, Writing, Business Management, Marketing, Advertising, PR & Communication, Special Events for Book Printing & Distribution. Video Production/Visual Media: All phases of Pre-, Production, Post-Production for Television, Internet TV and Special Programs including one-hour “16Things TV Magazine” series, Educational Events/ Workshops, and 24-Hour Telethons. App, Web-Site Development & Computer Programming: HTML, ASP, Sql, Photoshop, Web-Site to Database, Shopping Cart, Android & Apple App Development; WordPress Site Development. Graphic Arts: Photoshop, InDesign, Illustrator, Quark, Flash, Shockwave for Books, Board Games, Publication & Print Work, Web-Site Construction, Apps. Do Have The Desire & Determination To Develop into Someone That Really Makes a Difference? 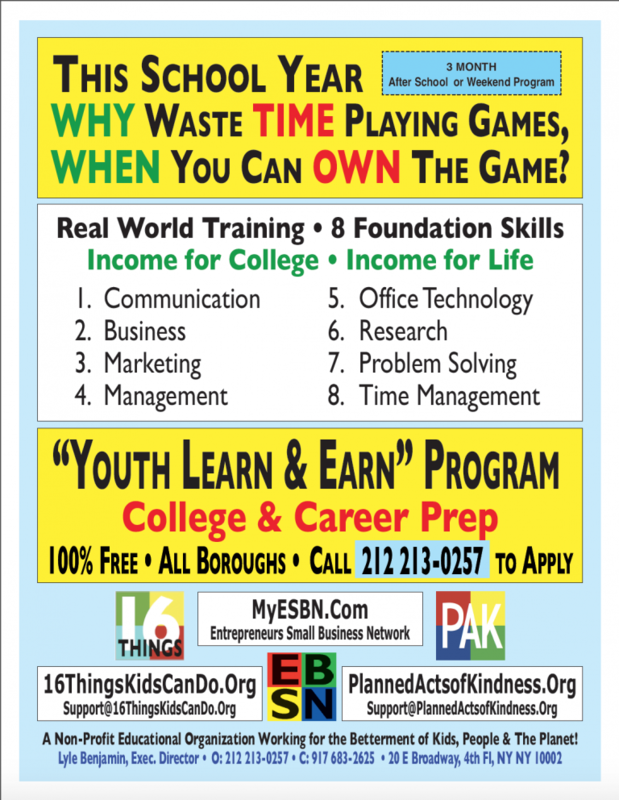 Youth & Adult “Learn & Earn” Programs to help you succeed in life. LEARN: The “Youth Learn & Earn” program is designed to provide high school and college students, veterans, etc. 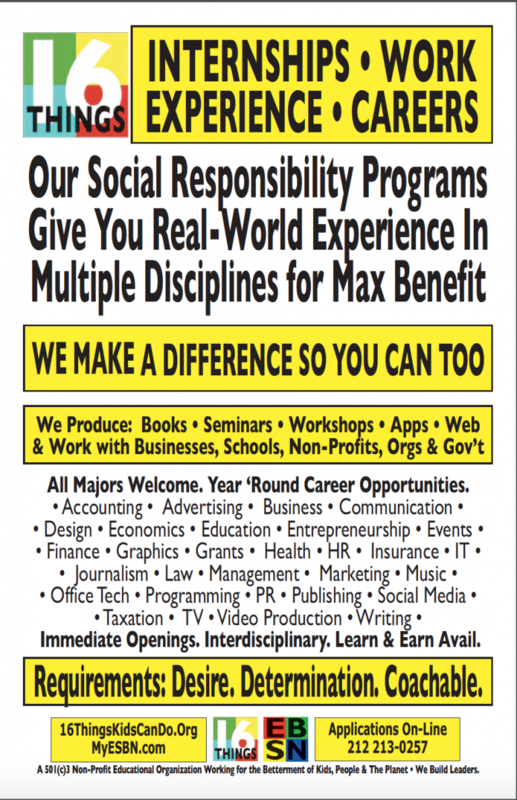 with training in real-world skills while working on social and business related programs that benefit the community. Trainees in the 3-month program learn communication, business, marketing, management, office technology, research, problem solving and time management skills. EARN: Participants have the opportunity to put their training and skills to use to earn significant income per week by program completion. Upon graduation, participants can elect to stay in the program as a full-time career position earning between $36,000-$48,000 annually. Adult Work & Career Programs to help you build the life you always dreamed. One of the fundamental areas that people struggle with over their lifetimes is money. More specifically, finances. In keeping with our mission, we created several excellent programs that provide people with the opportunity to learn and earn a five- or six-figure income while helping educate and protect individuals and families on many important areas of their lives. We provide free college and community based financial education workshops to teach people financial concepts they need to know in order to build effective retirement plans, educational funding plans, and estate preservation plans. If you think you already know this information, it’s still worth it to check out. We meet with CPA, CFP, CFAs, Owners, Businesspeople, Educators, MBAs, Lawyers, Accountants, etc. 95% don’t know what we teach. Our goal is to give everyone, regardless of education or income, the tools they need to become financially independent and achieve their goals and dreams. And that doesn’t mean that you scrapped together $50K, $100K or even $300K: Our goal for you is to be able to live off the interest that your assets generate — so you never have to eat away at your principal and run out of money. Most importantly, we make sure our client’s hard-earned savings and investments are never at risk due to market loss or health issues (like chronic or long term care if qualified). ​This is a government regulated, licensed professional career position in the financial services industry — However, no prior experience is necessary. All training is provided and you can earn while you learn. The only things you need to bring are your (1) desire to help people (2) determination to be successful and (3) a willingness to learn.